Dave has been busy trying to characterize the front end of the Rigol scope (DS1057A) he did a teardown of last week. Chris laments trying to go back to making 2 layer boards after being spoiled by 4. Dave will be giving a presentation to a physics conference next year. He will get to go check out some of their awesome lab gear sooner. The Hackaday Prize 5 finalists have been chosen with some help from Dave. Chris helped to cull the initial list of 850 entries. One of the popular favorites, the $300 Pick and Place didn’t make the cut and wrote about 3D printing jumping the shark. We hope the device ends up in the market at $300! 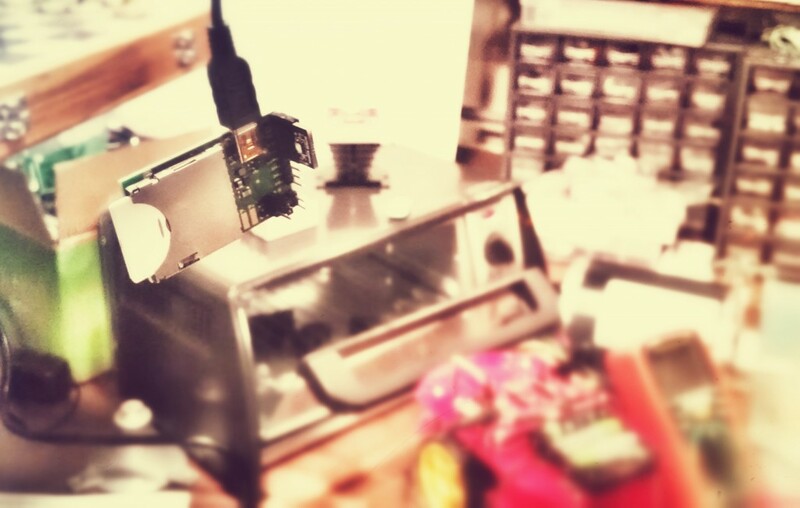 Chris took a step towards home manufacturing by beginning to hack together a toaster oven for reflow. He will be using the Contextual Electronics BenchBudEE board for control. There is a simpler version available on Kickstarter now called the Zallus. It has a nice looking touchscreen interface. Dave has an oven controller that only uses LEDs for indicating which part of the cycle the device is in (ramp, soak, reflow, etc), but it still gets the job done. It also has a “learn mode” so it can be recalibrated when there are different thermocouple placements or different amounts of thermal mass in the chamber. Chris has been on a buying streak lately. He just got bit by the robot bug and bought the RedBot from Sparkfun. On the IoT side of things, Chris picked up the Light Blue Bean, which allows easy Bluetooth Low Energy connectivity (but only from a mac for n0w). They also got their module certified for sale if you fall in love with it. Dave started using Patreon for viewer support. He can send special footage to backers on there. The Annonabox is a Kickstarter sham; they raised over $600k before their funding was put on hold when they couldn’t substantiate their claims about designing their own hardware. Chris will be travelling to Electronica in Munich, Germany this year. The amount of money being spent is already pretty ludicrous: Digikey is giving away a Tesla (and that likely won’t be the craziest thing there). We re-opened our campaign for the black Amp Hour t-shirts (and sweatshirts). Chris has been creeped out by the Internet of Things: watching the temperature in the Analog Life Lab tells you lots of things about what’s going on there. It was build using Luke Beno’s tutorial and board. This is also the argument for why Google bought Nest. Dave used to have a service like this before the webapp shut down. Another Google acquisition, you can watch Dave in his lab on Dropcam, even highlighting when there was movement using the historical function. Fellow Ohioan, Ken Burns (who is currently running the TinyScreen kickstarter) recently wrote about why he started his business in Akron. It’s possible to start a business just about anywhere, it was interesting to read his reason for Akron. Chris thinks that talent pool is a big factor in deciding where to locate a business. The Technical Illusions team (builders of the CastAR, founded by Jeri), just decided to move down to Mountain View to get access to a bigger pool. someone may be interested in a headless reflow oven. I wrote up a post about mine – too long a story to put here. It uses highcharts.com and jquery. to build up a web interface suitable for a smartphone or pc. no need to build any buttons or screen for the oven. It uses electric imp. I’ve been using it for the better part of a year without code tweaks or maintenance. it’s just one of my tools now. If you’re assembling the reflow toaster and want to cut your own stencils, I have to plug the gerber2graphtec python tool that hijacks the Silhouette (Portrait or Cameo) cutters. I have a portrait (amazon, $120) and a package of 3M transparancy film. I use an old gift card for my solder squeegy and a tub of goo from digikey. It’s been a gem. It’ll do a soic and discreet parts great (I’ve done 0603, SC-74-6). Haven’t perfected finer pitch stuff. Quarter pitch will bridge or cut the bit of web between pads and require rework, QFN tends to be difficult to get solder in the small cutouts, and finer pitch stuff is a fail (though others have shown better results – maybe I’m just lazy). Of course, I don’t have a fancy profiler on the oven. I wired a thermocouple to the middle of the rack, and just open the door a little bit and wedge something in it to control the temp. It only takes a few minutes. Theoretical and experimental physicists…. You mean Sheldon and Leonard? I found it interesting that Dave mentioned that the needs to hire someone. If he does, his business will likely change for the better. Having an employee really means that the EEV Blog will need to shift to a certain level of standard conformity in how it operates. Employees don’t like a haphazard work environment. cubicle drones maybe, I expect working with Dave to be more like hanging out in a hackerspace than slaving in corporation meat grinder. Chris, it was delightful to listen to you this episode. It sounds like your experience at Defcon had a lasting impression upon you. It’s nice to hear you addressing the issues discussed this episode. All the best. wearing Google Glass might bring you in trouble in Germany. It is seen as a covered recording device, especially because all video and audio recordings and the GPS position are forwarded to Google. As an experimental Physicist PhD, I can say that Dave will have no problem with his talk next year, and will probably have a great back and forth that results in people running back to the lab to try stuff. You probably read too much into the exotic buzz words. For instance, my masters work was “Quantum Computing using electrons on liquid helium.” Ooooh….! Day to day, though, was pretty much plumbing and refrigerator repair. Did make a summing amplifier once. That one is interesting, will add that project to the list of things we mention this week. Thanks! I am amazed at some of the creations I see on Hackaday. They are definitely advanced concepts, even if the work is done on a smaller scale.